Stainless steel worktops that make a striking addition to your kitchen! 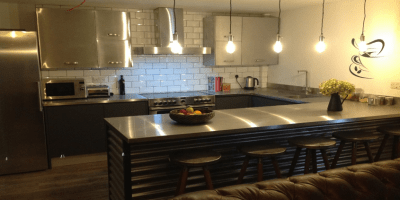 Stainless Direct UK is a family run business offering open and honest advice about introducing stainless steel worktops into any environment. 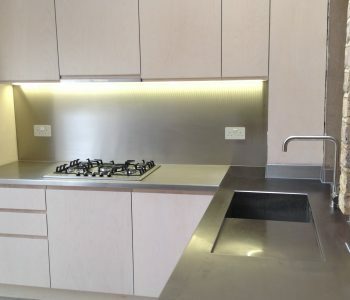 Whether it’s your home, office, commercial or industrial application, we understand that one size doesn’t always fit all so we design and manufacture all of our stainless steel kitchen worktops to your unique specification. Stainless steel has increased in popularity in recent years, due to it being both stylish and practical. It’s easy to clean, hygienic and perfect for sterile areas. It offers a unique look to any kitchen; it works well with the more traditional features like Belfast sinks and wooden units. 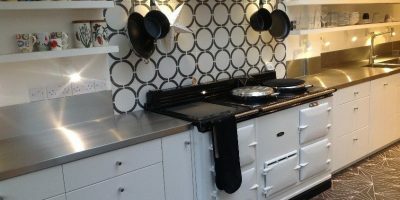 The trend for range cookers complimented with bare brickwork or contemporary tiles is being sought more frequently alongside the practical and sleek stainless steel adding a modern twist. Alternatively we find our customers making a feature of an island or combining the steel with other elements like marble, corian or glass; sometimes insetting slate or solid wooden pieces. Many of our customers simply opt for just the steel for the clean lines and smooth finish for their own bespoke look. We only use the best material – marine or 316 grade brushed stainless steel for all of our worktops. It offers maximum corrosion resistance, giving the highest protection against citrus acids and cleaning products to ensure your kitchen worktop remains in perfect condition. The thickness of the steel itself ranges from 1.2 – 1.5mm thick and we bond it onto a solid moisture resistant mdf core. As all of our worktops are made bespoke to order we can vary the finished thickness of the worktops from a slim 20mm to a chunky 120mm or thicker if preferred. The ultra thin look has been more popular of late, seeing us also produce a number of solid 5mm thick steel worktops which look incredible. 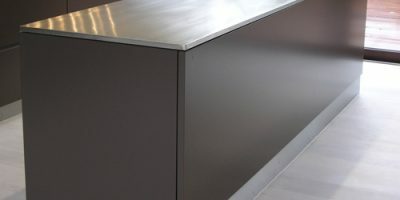 Bespoke stainless steel worktops - made to measure. The beauty of steel is that it can be joined together to create longer pieces, integrating end panels with either gorgeous curves or sharp ends or even completing seamless L-shapes which other materials wouldn’t allow. Our expertise allows these bigger pieces to be made so that they fit perfectly to your own specific requirements. Sometimes what makes a worktop unique is the finer detail – the thickness of the worktop or the finish on the corners all adds their own style to an otherwise ordinary shape. A square edge is the standard profile, or you can consider having the edge folded at an angle to create a shark nose profile giving the illusion of an ultra-thin worktop. 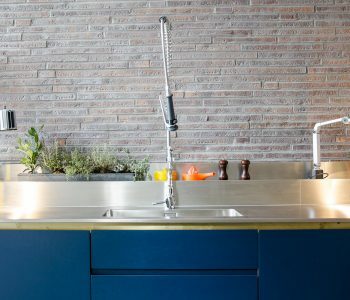 Add a waterfall edge to create a wet area around a sink or follow the lines of the cabinets and add a curve to the end of your worktop – all elements to make your design unique. Attention to detail, friendly and practical advice. Our team are open and friendly offering practical advice; we pride ourselves in our attention to detail, ensuring that nothing is overlooked. We always strive to produce the neatest finish incorporating joins, hobs and sinks where required, tailor making every project to suit individual kitchens and budgets. Customers can use our services as much or as little as they need. We offer a templating and installation service, so that our team can take responsibility for the whole project or simply converting the measurements you provide to CAD drawings ahead of manufacture. 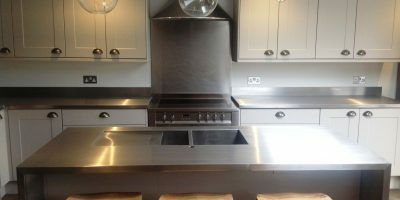 Your stainless steel worktops can be installed by our expert fitters or delivered for you to fit yourself. 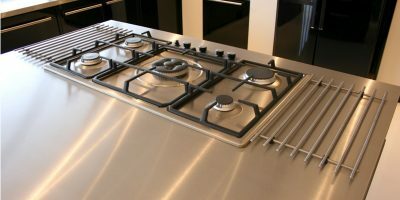 We will be happy to guide you through any stage of the process from the initial design and layout of your worktops to the finer details of how stainless steel can work in your kitchen. If you’re unsure about anything at all from measurements and sizes to shapes or sinks we will be pleased to help. We offer a wide range of products in stainless steel and can offer a range of other materials to either contrast or enhance your design, material such as copper, brass, galvanised steel or zinc. Many people opt for stainless steel because of the way sinks can be seamlessly integrated to the worktops. 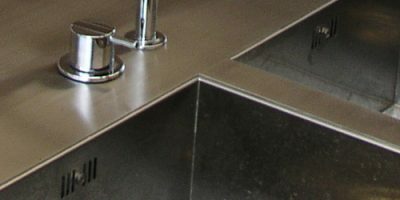 We offer a wide range of sink or sink and drainer units many of which can be welded into our worktops. Alternatively we can drop a sink onto the surface of the worktop in the traditional manner or we are one of the only companies that can offer a bonded sink; this is where we bond the sink to the underside of the steel for a neat finish. We offer a variety of fitting methods to suit all designs, with a wide range of sinks for all styles and budgets. Check out the range of sinks and accessories that we offer in Our Store. 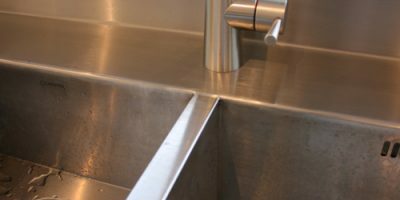 Welding a sink unit into place is the most popular method of fit within a stainless steel worktop; here the sink becomes an integral part of the worktop, flowing into the sink and out the other side with no lines, seams or joins. This gives a seamless integration between the sink and worktop. As we hand weld all our sinks into place, we use a thicker steel to cope with the heat and finishing processes required which means that not all sinks can be fitted with this method. For this reason we have separated the sinks that we know can be welded into their own weldable sink category on our website. A great alternative method of fit is to under mount and bond a sink unit into place; it is cost effective, but still offers a neat finish. Here we bond the lip around the sink to the underside of the steel, where the sink meets the worktop there is a discernible edge or seam leaving a fine line, but a sleek finished look. 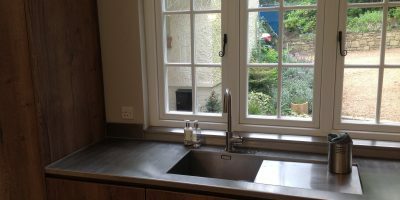 The beauty of this method of fit is that almost any sink unit can be bonded to a stainless steel worktop, thus increasing the range of sinks that can be chosen, or even re-using an existing sink. The more traditional method of fitting a sink is to drop the sink unit into place on the surface of the worktops where we seal the sink unit into place. This is a perfect method for those on a strict budget; for commercial or semi commercial kitchens. An island worktop is generally the centrepiece of many homes and kitchen’s, we can help you to create a stunning piece for your environment. Whether it is a standard shape worktop or with sweeping curves to the floor or welded end panels for a sharper look. Create a breakfast bar worktop, offer legs for support to the kitchen worktop or inset a piece of oak or walnut to help you realise your own unique stainless steel kitchen worktop feature. All of our stainless steel island worktops are usually folded and returned on all four sides and can feature sink units, hobs and pop up power sockets. Stainless steel worktops are versatile and look incredible alongside the increasingly popular traditional range cookers, the more modern induction units as well as standard hobs. Hobs can be surface mounted onto the kitchen worktop, can also be low profile or flush fit, sitting at the same height as the stainless steel worktop. We do this by rebating or recessing the hob into the worktop so it sits level with the steel of the worktops. Some hobs are even weldable to become a seamless part of the worktop. We have recently introduced the range of Pitt Burners to Our Store – an innovative cooking system designed to allow flexibility and powerful cooking all in an easy to clean outstanding looking design. As a standard, we fold the steel down at 90 degrees to the surface, we return the steel under at the front and ends as required. At the corner we have superbly honed technique for tightly folding the steel. This created a tight join and this is then welded and finished forming a watertight seal thus preventing water ingress, particularly important in vulnerable areas. Internal corners of the worktops are finished by welding a small section in and polishing to a smooth neat finish. We can soften a corner to take the edge off it, weld a small section in to create a small radius or create a broad sweeping corner welding a longer section in and following the curvature of a cabinet is no problem to our expert team. The beauty of stainless steel is its versatility and the fact that it can be welded together to create longer pieces. 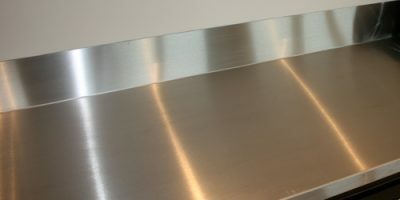 For longer sections of worktops or for bespoke shapes in stainless steel worktops we can weld joins where appropriate, a better finish is achieved by welding across a cut out for a sink or hob. Where this is not possible an alternative is a visible join, here the steel is fitted edge to edge leaving a thin line of a join across the kitchen worktop sealed with our CT1 for a smooth, neat finish. The final look of this type of join is entirely dependent on accurate measurements and is generally recommended with our team templating and installing the worktops for the best possible finish. Folding the steel over the ends of the worktop and fitting them together for a fold to fold join provides the best protection against water ingress and also some tolerance in the fitting, with the join being sealed using our grey CT1. For those that want one piece worktops with no joins – or have no cut outs to accommodate a welded join, we have been working with bigger sheets of steel, the 4 metre long sheets, allowing us to make longer and wider single pieces without the need for a join. Accessorising your worktop is another way of personalising the finished look. We can offer Splashbacks behind hobs and Upstands to the rear of the worktop, integrated or separate both of which create a stylish and practical seal against water ingress. Add an end panel, Door, Cornice or Plinth to complete the look. Choose from our extensive range of sinks, sink and drainers all with their own accessories too. Whether you prefer a sharper corner or something a little softer; a large bowl to take baking trays or something smaller; add a half bowl or a drainer making your space practical and suited to your own unique needs. We offer a wide range of taps, from standard to chef’s taps, to filter and boiling taps; also providing the innovative Quooker Taps for the ultimate all in one. All of which can be supplied with your stainless steel worktops – a one stop shop for all your project’s needs. These days power is vital in any environment, especially in a kitchen. We have practical solutions to give you all that you might need. 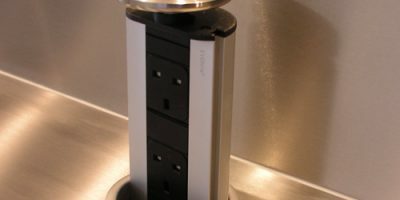 Our power sockets can be fitted into the stainless worktops some can be flush fit too retracting into the worktop, even with devices still connected offering a stylish solution to the practical necessity of a plug socket. Add to the ambiance of your kitchen, include Led lights for your plinth, we supply the transformers and will even pre-fit the lights to the plinth before they arrive. Take a browse through some of the unique selection of our completed Bespoke Project images below and contact us for a chat, send us your drawings or sketch and we will be happy to advise you from there. 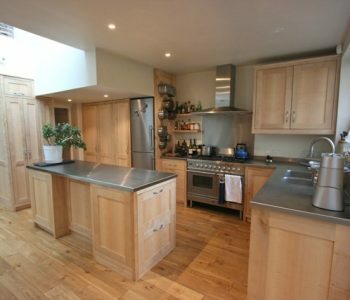 We are delighted to show a range of projects that we have undertaken, please scroll down through our Gallery and see some of the wonderful kitchens that our customers are thoroughly enjoying.